Brooklyn Heights, N. Y. — St. Francis College Terriers (7-9) beat down the Hawks of Monmouth University (3-15) on Thursday night 81-64 and improve to 4-1 in Northeast Conference play this season. The red-hot Terriers, who have won three of their last four games, took an early lead over Monmouth and cruised to a third straight victory as freshman phenom Jalen Cannon recorded a double-double- for St. Francis with 13 points and 12 rebounds. Junior forward Akeem Johnson was inactive for the first time all season. He has started all 15 prior games and is averaging 14.0 points per game in the last week while shooting 79 percent from the foul-line in his past eight contests. St. Francis’ strength and shooting proved to be the difference in the game as the Terriers out-rebounded their opponents 49-22 and converted 53.7 percent (29-of-54) of their shots compared to Monmouth’s 33.9 percent (21-of-62) display. Five players for St. Francis scored double-digit points, led by guards Stefan Perunicic and Brent Jones who both had 14 points each in the game. Forwards Travis Nichols, who started in place of Johnson, and Matt Milk combined for 24 points and 12 rebounds. Monmouth’s Will Campbell led his team with 15 points in just 17 minutes of play off the bench while starting guard Jesse Steele chipped in with 13 points. St. Francis had a 17-12 lead after nine minutes of play in the first half but soon caught fire as they went on a 20-7 run, shooting a scorching 67 percent (20-of-30) from the field. Monmouth meanwhile, only made eight of 29 shots (28%) throughout the game at this point. After a somewhat balanced last four minutes, the Terriers went into halftime with a commanding 48-28 lead over their NEC rival. St. Francis’ colossal 20-point lead is credited to the Terriers dominating the inside, out-reboundeding Monmouth 25-9 and out-scoring them 20-8 in the paint. Nichols and Jones exploded in the second half for St. Francis as the two combined for 17 points and 8 rebounds. Despite better defense in the second half by Monmouth, they were never able to overcome the double-digit deficit. The largest lead in the game for St. Francis was by 25 points with just under four minutes to play in regulation. The Terriers look to win their fourth straight game against NEC foe Fairleigh Dicksonsonon at home on Saturday, January 14. Brooklyn, N.Y. — St. Francis College Terriers (6-9) square off against rival Mommouth University Hawks (3-14) tonight in conference showdown at 7:00pm. Monmouth leads St. Francis 31-22 in the all-time series, winning six of the last 10 match-ups. Last season, on January 27, 2011, the Terriers beat the Hawks 62-61 despite shooting just under 30% from the field. Current Terriers’ forward Travis Nichols scored 16 points off the bench in the game. St. Francis started their NEC schedule last week when the Terriers beat Quinnipiac University 73-72 in thrilling fashion as senior forward Stefan Perunicic sank the game-winning foul-shot and scored a team-high 21-points en route to becoming the 27th all-time Terrier to join St. Francis’ illustrious 1,000-point club. The Terriers followed up the win against Quinnipiac with a 99-84 road victory over fellow conference foe Sacred Heart University on January 7, improving to 3-1 in NEC play for the first time since the ’01-’02 season. The 99 points scored against Sacred Heart were the most points by a Terriers’ squad in a game since they defeated Fairleigh Dickinson 110-103 on February 21, 2005. 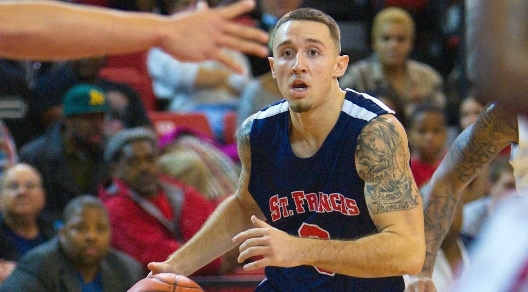 St. Francis made an NEC-high 15 three-pointers against Sacred Heart and shot 55.6% (15-for-27) from beyond the arc. St. Francis also shot a season-best 58.2% (32-of-55) from the field in the game and was 20-of-22 (90.9 percent) from the foul-line, also a season-high. St. Francis sophomore guard Ben Mockford recorded a career, and NEC-best, eight three-pointers against Sacred Heart and finished with a career-high 28 points in the game. Mockford leads the league with 48 treys and is 10th in the NCAA averaging 3.2 trifectas per game. Junior forward Akeem Johnson averaged 14.0 points per game last week and has started all 15 games this season for the Terriers. Johnson, a career 59% foul shooter, is shooting 79% (30-of-38) over his past eight games from the free-throw line. Freshman forward Jalen Cannon tied his season-high with 14 points in the win against Quinnipiac. Cannon has started three straight games and is averaging 7.3 points and 6.9 rebounds per game.